Which Beer Coupler Do I Need? How Long Will Wine Keep? This Blonde Ale recipe found on Brulosophy.com is a real crowd pleaser that is perfect for warm weather. It’s easy to drink, almost like a light beer with more maltiness and without the subtle fruitiness you might expect from a typical Kölsch. The finished product is pale straw to deep gold in color. It’s got a noble hop character which leaves a light to medium bitterness. This light bodied and balanced beer can seem somewhat like a lager. This blonde ale is an all grain recipe so it’s a bit more involved than the previous recipe (Irish Stout partial mash). We’re going to get all of our fermentables from a mash as opposed to malt extract. Mashing is combining crushed malts with hot water to convert complex starches into simple sugars that are more readily fermented. 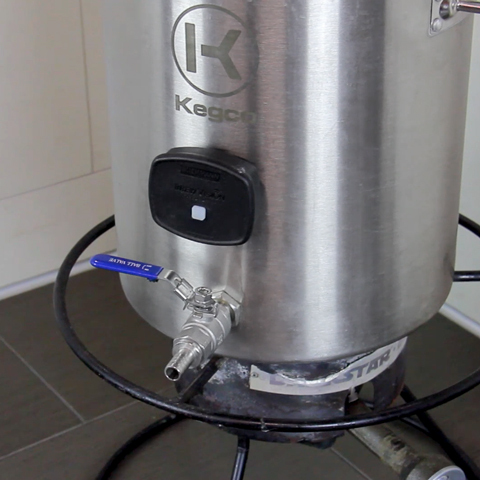 To start, fill a brew kettle with 5 gallons of water and heat it to our sparge temperature of 175° F. Transfer the sparge water to your cooler mash tun. Fill the kettle with 3.75g of water and heat it to our strike temperature (the temperature we add our grain) using a floor burner. You want to heat the water to 162° F to achieve your target mash temperature of 150° F. While the water is heating up, use a grain mill to crush your grain into grist for the mash and prep your mash tun. When the water reaches 162° F, turn off your burner and add your grain bag to the kettle using a spoon to push the bottom of the bag to the base of the kettle. The opening of the bag should stretch around the rim of the kettle. Now is the time to dough in (add all the milled grain). When doughing in, pour the grain slowly into the mash tun and stir to prevent dough balls from forming, as that will limit your extraction of sugars. Once all the grain is mixed in properly, check to ensure temperature is around 150° F, then close the lid and set a timer to 60 minutes. Every 15 minutes, give the mash a nice stir to ensure equal temperatures throughout the grain bed. Lautering is the process of separating the grain from the liquid, which is now sweet wort. 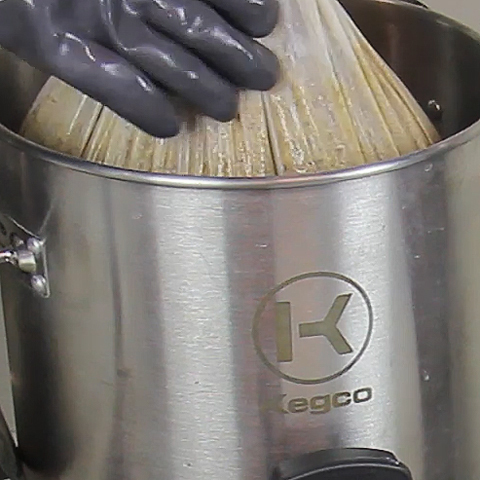 Wearing your brewing gloves, slowly lift the grain bag out of the kettle until it is above the liquid line. While it is suspended above the wort, gently spin the bag to remove excess liquid. Some brewers frown upon straining the excess liquid because it is said to pull out tannins from the grain, but we have not noticed any negative effects and this step yields maximum wort while making cleanup easier. Sparging rinses the grain bed and pulls out any remaining sugar. With this process, we do a batch sparge at the end of the mash. 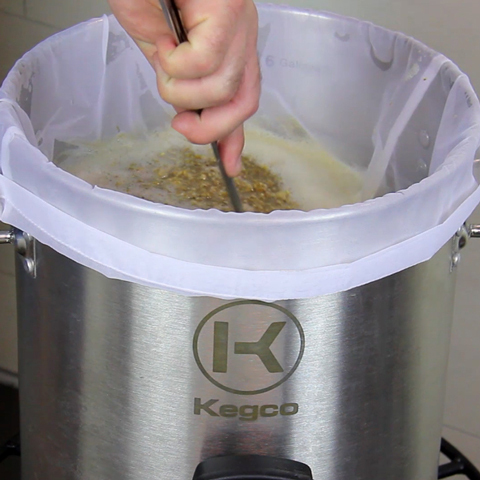 Place the grain bag in a secondary vessel such as a bucket or another kettle. 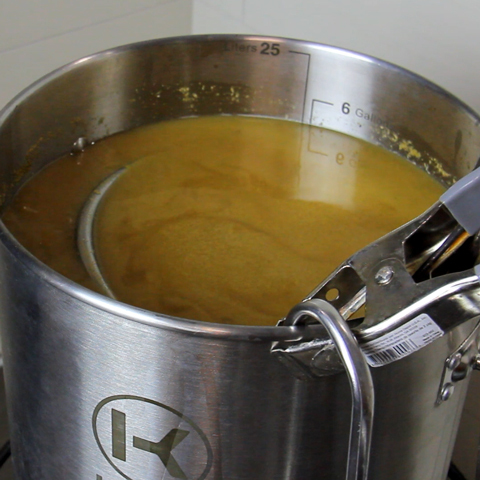 Pour the sparge water into the mashtun and give it a good stir. Let it sit 10-15 minutes, lauter it just as you did in the previous step and then pour the wort into your boil kettle. Heat wort to a boil. 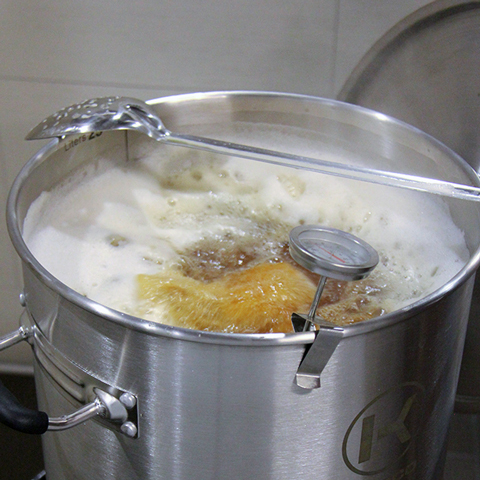 Be careful when nearing boiling because of hot break – a brief period of foaming that can easily cause a huge mess. 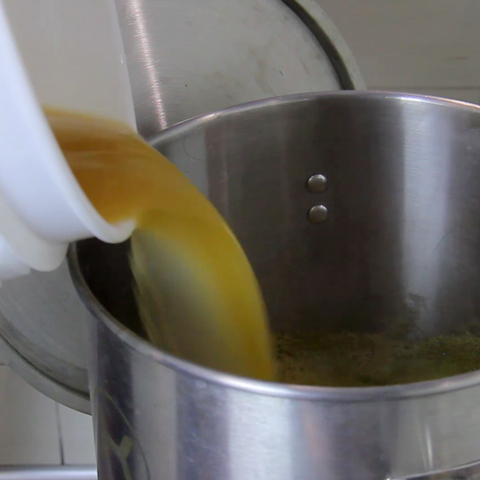 Stirring the wort and approaching the boil slowly is the easiest way to prevent boil over from hot break. Once the boil is reached, start a timer for 60 minutes. With 55 minutes left in the boil, add 0.25 oz. of Galena hops. With 25 minutes left, add 0.25 oz. of Cascade hops. When there are 15 minutes left on the timer, place your immersion chiller in the boil to sanitize it. At the 10 minute mark, add a quarter ounce of Cascade hops and a quarter ounce of CTZ hops. The final 0.25 oz. of Cascade hops should be added with 5 minutes left. We want to get our wort cooled as quickly as possible so run hose/ground water through the immersion chiller to get the wort as cold as possible, then use an ice bath to reach our pitching temperature of 56° F. When the proper temperature is reached, transfer the wort to your primary fermenting vessel and pitch yeast. Ferment at 58° F for four or five days before ramping the temperature up to 65° F over the next few days. The final step before conditioning is to cold crash for 48 or more hours after FG is stable. From there, you can either bottle it or keg it at that point, which is a process for another post. Home Brewing Blonde Ale, How-To, Recipe. permalink. Gregory Weldon on Open Source Soda & Other Non-Beer Keggables! admin on Which Beer Coupler Do I Need? Jason A. Sims on Which Beer Coupler Do I Need?